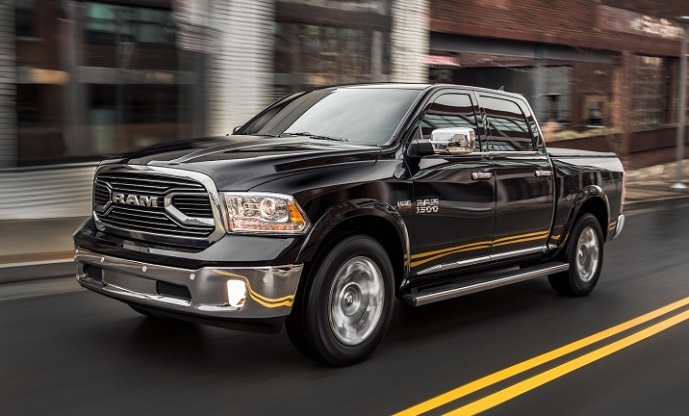 The RAM 1500 is among the trio of top-selling light-duty trucks in the US. This full-size half-ton ute hasn’t actually been fully redesigned since 2009. However with gradual upgrades over the years it has achieved to be competitive in all aspects. It also brings to you many options which will satisfy everybody’s demands. It comes with three cab styles, three bed lengths, either two- or four-wheel drive. There is also a choice between three powertrains. There is also a range of trim options that covers everything from the base working truck to the ultimate luxury versions. Among many options, you can pick 2017 Ram 1500 Crew Cab and let’s see what it has to offer. The Crew Cab version features four conventional doors. In this case, rear doors are bigger than on the Quad Cab version and that provides more rear legroom. This version is available with two bed lengths including 5’7” and 6’4” options. There are also three engine options and as many as eleven trims. The design of the 2017 Ram 1500 Crew Cab is familiar form in the truck industry. Its signature crosshair grille design can be recognized easily among the crowd of other trucks. There is also sculpted hood and pronounced shoulder line that also distinguish this model from others. However, there is also many different finishes and textures that are available giving everybody a chance to add its truck unique identity. Among options, you can also get blacked-out grille on the Rebel model or billet port grille on the Laramie models. One color exterior or two-tone finishes, chrome or powder coated accents, you chose. You can also pick 17-, 20- or 22-inch wheel sizes and among them different finishes and designs. On the inside, the RAM 1500 is both versatile and refined. Even work truck versions feature high build and material quality. With each upper trim, it is becoming more luxurious and refined. The comfort of seats is also excellent and they provide good body support for long rides. Crew Cabs also have sufficient rear legroom. Inside the cab, you will also find many practical storage bins and compartments. The model also offers unique RamBox system which provides lockable compartments situated inside the cargo bed. The Ram provides many modern features in tech, comfort and safety aspects. Techwise, there is Uconnect infotainment system with either 5- or 8-inch screen. The system is responsive and easy to understand. Upgraded version provides smartphone integration, emergency services, voice controls, WiFi hotspot, USB, Bluetooth, etc. There are also several versions of the sound system. Other available features include heated and ventilated seats, leather upholstery, navigation, keyless entry and ignition, power pedals, wood accents, power adjustable seats, driver memory setting, heated rear seats and much more. On the performance front, all 2017 Ram 1500 Crew Cab models come with an 8-speed automatic transmission. Standard is rear-wheel drive. As an option, you can get four-wheel drive with two-speed transfer case and low-range gearing. However, there are part-time systems with either manual or automatic mode switching. The standard engine is a 3.6 liter Pentastar V-6. It produces 305 hp at 6, 400 rpm and torque of 269 lb-ft at 4, 175 rpm. If you are asking about fuel economy, expect around 20 mpg combined depending on the configuration. Towing capacity with this engine is up to 7, 610 pounds. Another available engine is a 5.7 liter HEMI V-8. It is good for 395 hp at 5, 600 rpm and 410 lb-ft of torque at 3, 950 rpm. It will return around 17 mpg combined. Towing maximum is 10, 640 pounds. The Ram 1500 also offers turbocharged 3.0 liter Ecodiesel V-6. It is capable of producing 240 hp at 3, 600 rpm and 420 lb-ft of torque at 2, 000 rpm. It is fuel economy champ with 23 mpg combined. On the other hand, it allows up to 9, 210 pounds of towing capacity. The price of the 2017 Ram 1500 Crew Cab varies depending on many available configurations. It starts from just above $30, 000 and exceeds over $50k in top variants.